(NewsUSA) - It's the time of year to unpack the crockpots, pull out your team colors, and break out that Sunday football attire because football season is back! As autumn approaches and school is back in session, many families start to gear up for those weekends of tailgating. If you're looking for some creative ways to wow your tailgate attendees or throw an awesome football party, follow these tips that are sure to be a hit. * Celebrate National Tailgating Day: The first Saturday of September is recognized as National Tailgating Day. From team colors to face paint and a spread of the best finger foods, watching your favorite team dominate and showing team spirit has never been easier. Consider adding a lean protein to any dish to keep those tailgaters energized all day. By using a crock pot for turkey chili or buffalo chicken dip, transporting food is mess- and hassle-free. * Sunday Football Snacks: NFL football season is around the corner and that calls for viewing parties filled with family and friends. Make your family room couch the go-to Sunday headquarters with football party food for everyone. Weather permitting, dust off the grill and pile up the charcoal because no party is complete without meat. Barbecue Chicken, Spicy Buffalo Wings or even Teriyaki Pulled Pork all cook well over a flame. 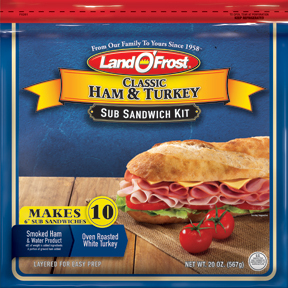 If you're looking to step away from the grill, consider using Sub Sandwich Kits from Land O'Frost. The Sandwich Sub Kits make 6 to 10 sandwiches and come in five different flavors, including Smoked Ham & Oven-Roasted Turkey, Italian-Style, Honey Ham & Honey Smoked Turkey, Primo Italiano and Black Forest Ham & Turkey. For a savory taste to last the whole game, make your own favorite sub sandwich. * Step Up Your Sweet Side Dishes: Take care of your sweet tooth by filling up bowls with honey-roasted cashews, M&M's or yogurt-dipped raisins to satisfy all those sugary cravings. To get creative, try baking desserts in football form. Some crowd favorites include cookies and cream football cheese ball, cream-filled chocolate donuts, football-shaped cookies, or football s'mores brownie batter dip. With these go-to tips, your next tailgate is sure to be a success -- And may the best team win. For coupons and more information about recipe ideas for the whole family, visit http://www.landomoms.com/recipes.